Description: McLeod Farms offers fresh strawberries harvested daily from late March through mid June, and we offer You-Pick from mid May through June. 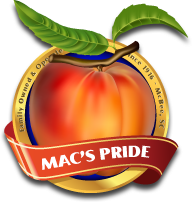 Peaches are the signature fruit of our business, with over 30 producing varieties on over 700 acres. Harvesting begins in late May and peaches are hand picked daily until mid September. During this time we also harvest Sweet Corn, Squash, Cucumbers, Eggplants, Bell Peppers, Okra, Tomatoes, Cantaloupes, Watermelons, Scuppernongs, Muscadines, and Blackberries. We offer You Pick Blackberries from June through July. Our Local Market is open year round offering jarred products and other season produce. We also have a bakery that serves up Fresh Baked Breads, Cakes, and Pies. Custom arranged Gift Baskets filled with jarred products and bakery goods are made especially for you for the Holiday season or any special occasion throughout the year!